Q: How do I eliminate the “minty” cooling sensation in baked goods made with erythritol? Answer: Reduce the amount of erythritol you’re using, and/or use another sweetener along with erythritol in your recipe. In my dessert recipes, I like to pair a good-tasting stevia extract with erythritol in order to boost and “round out” the sweet flavor. I use NuNaturals brand JAJA Stevioside brand extract since it does not have an aftertaste when used properly. The pure powdered stevia extract is what I use for the recipes on this blog since it is very concentrated and does not contain carby fillers (starches or sugars to add “bulk” to it, e.g. maltodextrin). To sweeten your batter or dough with stevia and erythritol, start with a very small amount (1/32 of a teaspoon) of stevia and add more, pinch by pinch, till your dough tastes sweet, but not bitter. Then, add a little erythritol, and taste the batter again. Mix in more erythritol and keep tasting and adjusting till your dough is sweet enough. You want something to be little too sweet if you’re going bake it. Remember to use as little erythritol as possible to avoid the “cool” aftertaste. It takes some practice, but you’ll get a feel for it! 🙂 You could also use artificial sweeteners like Splenda or saccharin to boost the sweetness of erythritol while keeping your recipe low in carbohydrates. I dislike the aftertaste and the chemical processing associated with Splenda and saccharin, so I don’t have much experience baking with them. Another solution to the “cooling” problem is to add ingredients like xylitol and xanthan gum that keep the erythritol dissolved. Read the questions and answers below for more information about this. Q: How can I get erythritol to dissolve more easily? How can I ensure that my baked goods made with erythritol do not taste gritty? A: Keep erythritol dissolved to avoid grittiness or a cooling effect. Grind erythritol into a powder in order to dissolve it in cold or room temperature liquids. The texture of powdered erythritol should be like that of powdered sugar. You can buy erythritol in powdered form, or grind it yourself! J I use a coffee grinder or my Magic Bullet blender to powder erythritol before using it in recipes that require that step. The recipes on this blog require you to measure out your erythritol before grinding it into powder. In recipes containing a lot of fat (e.g. frostings, “fudges,” and homemade chocolates, use as little erythritol as possible, or none at all, to avoid a gritty consistency. I like to combine erythritol with xylitol, xanthan gum, and sometimes a little honey to minimize erythritol’s tendency to crystallize. See the below questions for much information on how to use xylitol and xanthan gum with erythritol. Q: How do I avoid a dry and crumbly texture when using erythritol? A: Increase the amount of moisture in your recipe. If you’re making a cake, add a little sour cream or coconut milk to the batter, or bake the cake for a shorter length of time. If you are making a cookie or other hard pastry, you won’t achieve the best-tasting results using erythritol and xylitol. Cookies require sugar for structure and a crunchy or crispy texture. You can only make cake-like cookies with xylitol and erythritol. Q: What is xanthan gum, and how do you use it? A: Xanthan gum is a naturally derived thickener with zero carbohydrates, subtracting fiber. A little bit goes a long way in most recipes! It can enhance the bread or cake-like texture of gluten-free pastries, and increase the “creaminess” of liquid fillings and ice cream. To ensure that your treats made with erythritol don’t become gritty or “cool”-tasting, you can add a little xanthan gum (start with 1/8 of a teaspoon), which forms an invisible web that will stop erythritol from crystallizing. You can get away with using more xanthan gum in a baked dough or batter than in a sauce you are thickening. In liquids, xanthan gum can quickly become slimy, so add it little by little, whisking and checking for consistency. Q: What is xylitol, and when do I use it? How do you use xylitol with erythritol? A: Xylitol is a sugar alcohol with a slightly different molecular structure than erythritol. It has less of a tendency to crystallize and taste “cool” compared to erythritol. Using a small amount of xylitol (1/2 teaspoon to 2 Tablespoons, depending on the recipe) can help to keep the erythritol stay dissolved in your desserts. I use as little xylitol as possible in my recipes since I get unpleasant side effects (gastric discomfort and bloating) if I eat more than a small amount. People vary in their tolerance to xylitol. Xylitol is unsafe for some animals due to how their bodies process it, so be sure to keep your treats made with xylitol stored out of reach of pets. 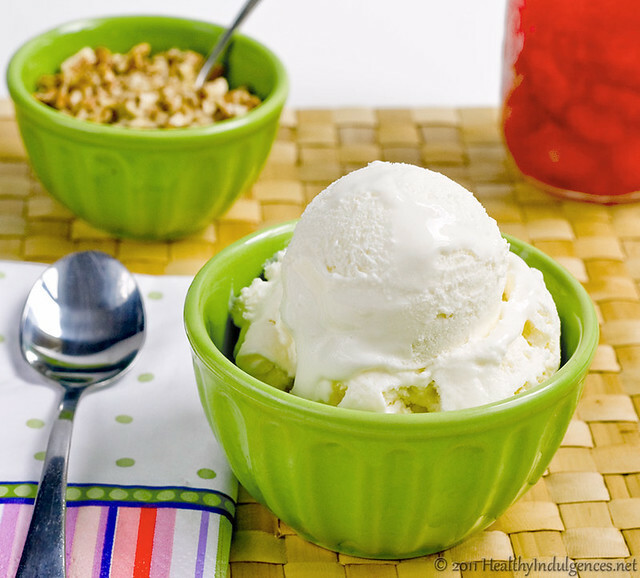 This healthy vanilla ice cream recipe is sugar-free and a snap to make. Just throw everything in your blender or Magic Bullet, chill, and freeze in your ice cream maker. No cooking or fussing with eggs required! There a two versions of this posted below – one version made with ingredients available at the grocery store, and one version with the usual sweeteners (erythritol, xylitol, and stevia) I use for this blog. Try the version with the ingredients that suit your taste and lifestyle. The ice cream recipe using erythritol, xylitol, and stevia is my favorite since it has no aftertaste and uses natural sweeteners. Since there is no sugar in either of these recipes, the ice cream is best consumed within 24 hours of making. Otherwise, leave your storage container out on the counter for 10 minutes, or till it becomes softened n’ scoopable. It’s worth the wait! A an easy sugar-free ice cream with no custard making required! The vegetable glycerin and inulin (a powdered plant fiber) help to keep the ice cream soft and scoopable. If you do not include these ingredients, you should try to eat the ice cream with 8-16 hours of churning, as it will harden too much to scoop after prolonged storage. Add half and half, heavy cream, sea salt, erythritol, xylitol, and stevia to blender. Add vanilla and xanthan gum. Chill mixture in a bowl (or in your blender) in the fridge overnight. For faster chilling, place mixture in a bowl, and set it over a larger bowl full of ice cubes and water. Cover bowl containing ice cream mixture with plastic wrap. Chill mixture in ice bath for 30 minutes, stirring occasionally, till the mix is very cold to the touch. Pour ice cream mix into ice cream maker and freeze according to the manufacturer’s directions. Smooth the freshly churned ice cream into a tupperware containers, and cover with plastic wrap touching the surface before closing the lid. Let ice cream harden in the freezer for 4-6 hours before attempting to scoop it. If you are impatient, you can enjoy your ice cream soft-serve style, straight out of the ice cream maker! *You can replace the erythritol and stevia with 3 Tablespoons Truvia + 4 packets of Splenda. You could also substitute 2 Tablespoons of xylitol for the erythritol. **Inulin is pure fiber, so it is not included in the calorie and carbohydrate counts. Do you have any questions concerning sugar-free baking? Leave ‘em below in the comments! « Bread, made healthy! Tasty Grain-Free and Low Carb Rolls, perfect for sandwiches. 62 Comments on Sugar-Free Vanilla Ice Cream + the Comprehensive Alternative Sweeteners Information Post! How does the carb count on this recipe compare to regular ice cream? I looked at some "no sugar added" ice creams in the store recently, and the carbs were as much if not more than the regular "with sugar" ice cream. Hi, Brian! I posted the carbohydrate counts. Storebought no sugar-added ice cream normally contains maltitol and sorbitol. Maltitol is not a low carb sweetener, despite the fact that it is sugar-free. 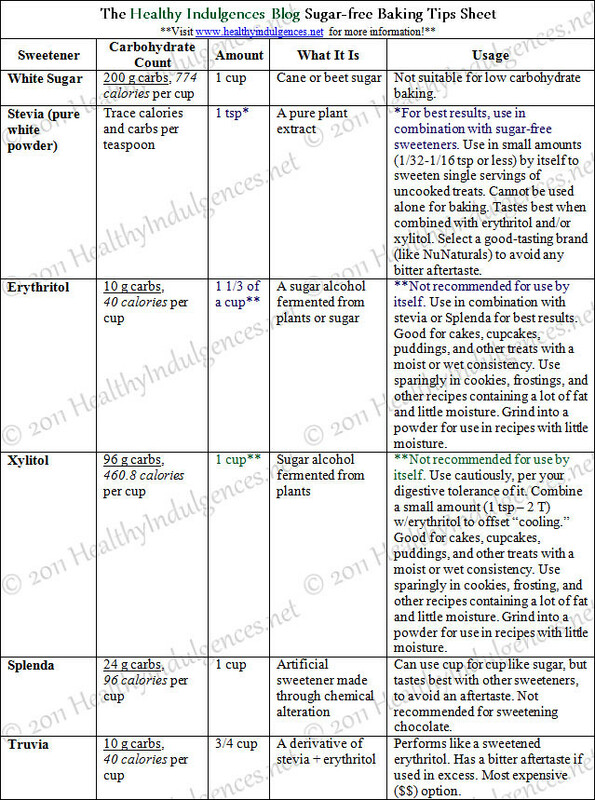 Please note the carb counts for erythritol, xylitol, and Truvia listed on my chart. I updated the post with the carbohydrate counts underneath the ice cream recipes. Thank you for your comment! Ice cream! I love you right now Lauren. It's over 100 on most days here I will definitely be trying this to help cool down in the afternoon. What a great sweetener guide, BTW! I will definitely be referring to this as I experiment more this summer. Thank you so much for the Alternative Sweeteners Information Post. Can you please suggest how to use these substitutions for Agave? I'd much rather use Erythritol/Stevia/Xylitol, but am chicken when it comes to experimenting. You're the best!!! Thanks and more thanks! I always enjoy your recipes. I cook and bake with either Truvia or Erythritol/Stevia mix and it's very refreshing to see that I am not alone in using these sweeteners. Thanks for the great post! I'm going to try your ice cream and see if I can make a successful batch! I recently purchased the Now Better Stevia Glycerite in liquid form, do I use the same amount in the recipes compared to a powdered form? Have U tried a sweetner called "whey Low" it has 1/3 the carbs of sugar & is made from whey? I’d just like to say that I made a delicious whipped cream topping using Truvia the other day. I put this under the high-fat “frosting” category, but I had no problems using the Truvia to sweeten it. I guess the cream probably has enough moisture relative to butter to make it work. It had a luscious cool whip consistency and held this texture over several days. I just wanted to share so no one is too afraid to try Truvia in a topping, it’s my main alternative sweetener of choice. If anyone is curious about the specific recipe, I’m going to try to get it posted soon. Thanks for your comprehensive post on this, your blog inspired much of my low sugar/carb baking experiments and helped introduce me to alternative sweeteners! I do use erythritol and xylitol alone, and the flavor/consistency of my goods don't suffer. I despise stevia and have never found a formulation or concentration that I don't find bitter. I add both E and X to the WET ingredients of a recipe rather than the dry, and let them sit for a little while, so that they can dissolve properly and avoid the cool flavor. Using either sweetener in something that is wet enough for total incorporation is the best way to avoid the cool flavor (you never get the cool flavor in coffee, for example, even though it does actually cool the coffee a bit faster). However, I never use E alone in any food that will be chilled after preparation, because it crystallizes HARD; you recommend xanthan gum to avoid this, but polydextrose works as well in small amounts. Still, I use X in recipes that will be chilled. Make sure you don't use either E or X in recipes where strong fermentation is desired (for example, kimchi), because they tend to inhibit yeast and bacterial growth. I do use one or the other in my kimchi after a couple days because it makes it last very long without getting overfermented. Yeasted bread recipes may by slightly affected. I don't make regular bread anymore so it doesn't bother me. Does anyone have any experience with isomalt? I have reason to believe it may work better in a recipe like this ice cream. It has an even lower heat than erythritol and xylitol, but that won't be a problem in an ice cream. Gastric sensitivity may be a problem for some, but I have significant amounts of isomalt daily and don't seem to have an issue with it (maltitol and sorbitol tear me up). I do use Nunatural's pure stevia extract alone in baking (for example, a cheesecake I made last night, and a pumpkin pudding I made 3 nights ago), so I'm curious what your experiences have been with it. Granted, cheescake would have some lactose, and pumpkin likewise has some natural sweetness. Recipes need to be adapted to make up for the loss of bulk, though. What problems have you discovered in baking with it? I love your blog, btw. It's just a great source of information for people who are low-carbing but love desserts. I also appreciate your attention to allergies too, since my son has the dreaded (and deadly) peanut/tree nut allergy. Brandon – Let me know how the ice cream works out for you. I love your comments! Anonymous – I will put in an upcoming post the conversion for agave. Am still trying out different recipes that call for agave using alternative sweeteners. Gilliath – Please share your experience baking “hard” cookies with erythritol. I would love to see a recipe for these cookies if you don’t mind sharing it with us! Tangeline – I’m purchasing a bottle of stevia glycerite to try it. I remember trying it and thinking it was bitter a few years ago, but perhaps the company has since improved the formulation. Mama Mia Johnson – Thank you for your nice comment. Good luck cooking in your dorm! Haha, I remember those days like it was just last year. 😉 I have not tried whey low. It does not appear to be significantly lower in carbohydrates than regular sugar. If you find out more about this, please share your information with us! Another Lauren – Thanks for sharing your recipe for whipped cream topping with Truvia. It sounds easy and delicious! Glad you found the post helpful. Anon – I have not tried Yacon syrup. Thank you for sharing your tip about glycerine. I have tried it, but I find it takes a couple of tablespoons to keep ice cream soft. Unfortunately, it’s not low in carbohydrates. If it fits into your plan, it’s certainly a useful ingredient to have on hand! Speedwell – Thank you for sharing that helpful information! Have you tried the pure Nunaturals stevia? Is PolyD easy for you to digest? I know it’s packed with fiber. I have experimented with isomalt. It makes wonderful cookies with the cooling effect of erythritol or xylitol. Isomalt does, however, give me severe gastric upset, so I only used it once. Madison mom – It’s great to hear that you’ve baked with stevia alone. I haven’t found that it holds up to heat well. I also detect the underlying flavor of stevia in the sense that it has a single-note sweetness versus a sugar-like rounded sweetness. Perhaps with natural sugars, like you were saying, it tastes just fine when used without another sweetener. I am so happy you’ve enjoyed the recipes, Madison_mom. Thank you soooo much for taking the time to post your recipes, sweetener guides-everything you do for us! I'm not patient or creative enough to experiment the way you do, and I appreciate all of the natural substitutes you find for us. YOU are a genius!!! I appreciate you more than you know! Hey Lauren, wanted to ask if you've done anything with Just Like Sugar, made from chicory root? Been reading about it lately, wondered how it compared to other sweeteners. I just got myself an ice cream maker looking forward to trying your recipe. Thank you for posting all your wonderful recipes. This ice cream was so delicious! Used Truvia and liquid sucralose. Also soaked a sliced vanilla bean and seeds in the cream for a couple of hours beforehand, let it chill 24 hours before putting it in the IC maker. It was fabulous! Great comprehensive post! Thought I'd share a little tip that was passed on to me by a reader. When using larger amounts of erythritol, you can help reduce the cooling sensation with a bit of xanthan gum. Works well for icings and candies that are heavy on the erythritol. I will definitely be trying this to help cool down in the afternoon. What a great sweetener guide, BTW! Thank you for the very helpful Sugar Free Baking Tips sheet. Lauren, I seem to have an adverse reaction to stevia and have to use an erythritol/splenda(fiberfit) combo. Will that work ok for baking? And if so, how can I convert your erythritol/stevia recipes to erythritol/splenda (fiberfit). I'd also be interested to hear if you know anything about "Just like sugar" made from chicory. Thank you so much. Love your blog. Hi, Stacy! I know this is an old comment, but I wanted to respond to answer your question. I just got some erythritol/chicory sweetener and am playing around with it. Stevia and erythritol are the main tools in my arsenal for now. Will include a review of “Just Like Sugar” if I have success with it. Thanks for bringing it to my attention! Lauren, you've done it again! Seriously, this is the best low-carb ice cream, ever! I've always had a problem with my ice creams being "icy" but with your addition of xantham gum (and I added a touch of honey) it is so smooth and creamy, heavenly! I tweaked the recipe a tad subbing 8 oz sour cream & 8 oz milk for the cream/half & half and added 6 frozen strawberries for a yummy Strawberry Sour Cream Ice Cream. Too good! I wish I had an ice cream maker at home. The (natural) sugar-free ice cream seems delicious!!! For now I have to please myself with a store bought Low Carb High Fat ice cream! It's not the same! where do you even FIND a low carb high fat ice cream in the store??? i can find MODERATE carb LOW fat ice creams but thats about it.. seems like they always want to take out the fat too!! Which makes it that much harder to get a good texture heh. But then thats why we are here right? I'm definitely going to try this. I just hope this recipe will finally be the one that doesn't turn into a hard vanilla ice brick! I had given up on making my own ice cream just for that reason. I'm hoping this one is going to be creamy after being in the freezer for a few hours? LUV LUV LUV your recipes!! Thank you so much for your dedication to this site and your followers. We'd be lost without you! I’m sorry you’re an all natural lifestyle food blog but you advocate mixing natural sugar free sweeteners with chemically processed ones? Does that make any sense? Other than being expremely sweet I have used Stevia/Erythritol by itself and the baked goods come out fine. I think it’s just finding the right balance. Xylitol can make some people experience a laxative effect so be warned. Dana, I advocate using which ever sweetener fits your diet plan and personal preferences since I am not a medical professional. Hi Laura! I made a (giant) cheesecake this weekend that called for stevia (to equal 1.5 cups of sugar) as the only sweetener. I used an online conversion tool that indicated I should use 2 and 1/4 tsp. I used NuNatruals pure stevia extract – but it came out terribly bitter. The cheesecake smelled SO good – it was crushing to have it turn out so horribly wrong. Every recipe of yours that I’ve tried has turned out to be fabulous – I’m really hoping you can steer me to the right sweetener combination to replace the 1.5 cup of sugar in my cheesecake recipe. Thanks! the kind that can technically be ‘subtracted’ or not. Thanks!! Hi, Seven! I count the 10 carbohydrates per cup of erythritol as actual carbohydrates, just because there’s no conclusive information stating that we can completely exclude the carbohydrate calories from erythritol. Most sources state that erythritol contains 0.2 calories/gram. Hope that helps! Marie, thanks for your comment! It’s great to read that you’re excited about getting started with sugar-free sweeteners. I have not tested my blood glucose levels after eating these recipes as I am not diabetic. I do hope to work with diabetic patients someday. 🙂 These treats have helped me to cut back on consumption of sugar and flour, which has helped me to maintain a 30 lb weight loss and manage my chronic GERD for the past 5 years. Oh, glad you found me!! And I guess that does make sense. As much as I love to imagine any amount I use counts as zero… 🙂 I mean, I bet it comes pretty darn close! We SHOULD probably assume the .2 cals per gram are from carbohydrates. Did you use some kind of method to come up with 10 effective grams, per cup or just decide on that as a likely candidate? And should I assume that you are using this 10g per cup in your nutrition calculations on your recipes with erythritol? Hi just found your site and Am a new Baker/cook using non-sugar sweeteners. Am I missing something or is there not an amount of xylitol in the ingredient list? Hi, Adrienne! I did not include xylitol in the recipe list because I used erythritol in this particular recipe. Unfortunately, I’m sensitive to xylitol’s negative GI effects! If you can tolerate it well, you can certainly use it in place of erythritol. You’ll need half the amount of erythritol listed to sweeten most recipes sufficiently. Xylitol is about twice as sweet as erythritol. Hope that helps! Hi, Adrienne! I updated the recipe with the missing xylitol – thank you for catching that! Had to read through it again to notice the discrepancy. The reason I add a little bit of xylitol to recipes with erythritol is because it stops the erythritol from crystallizing and becoming grainy in texture. Using both sugar alcohols seems to help with the texture immensely! You can definitely double this recipe with good results. Hi, Bigpianoguy! For any of these recipes, you can half the amount of erythritol to get the appropriate amount of xylitol. The recipe could be doubled, and work well in a larger batch. Hi, Bigpianoguy! I updated the recipe with the missing xylitol – thank you for catching that! Had to read through it again to notice the discrepancy. The reason I add a little bit of xylitol to recipes with erythritol is because it stops the erythritol from crystallizing and becoming grainy in texture. Using both sugar alcohols seems to help with the texture immensely! You can definitely double this recipe with good results. aftertaste at all. It worked wonderfully. Thank you, again. Hi, AZblondie! I’m so glad to hear that the recipe worked out well for you! Did you use inulin? What kind of stevia did you use? Hi Lauren. My strawberry batch came out perfectly, too. The only thing I would do next time is just add a touch more sweetener, since the strawberries were a little tart and more sweetness was needed to compensate for that. This recipe is amazing!!! I made it as written with the xanthum gum, inulin, and glycerin. It came out creamy and delicious! The first time I tried to make ice cream, it came out all ice crystalized and that was not good. They texture was way off. I am so thankful I found this recipe. I was wondering if you have one for Chocolate Ice Cream? I would love to make that flavor but not sure what to add. Maybe cocoa powder, but how much? Please let me know if you have a recipe for that to share. Thank you so much. Made this last night and it’s really good. I added three tablespoons of cocoa powder and three tablespoons of Lily’s chocolate. I also froze some peanut butter on a silpat mat overnight and crumbled that in sooo good. I used the inulin, glycerin and gum and I think it really helped the texture. Very smooth and custard like. Whole family enjoyed. Are you still posting recipes with no sugar sweeteners? I am a diabetic and just discovered your blog when I posted the question,” how to reduce the cooling effect of erythritol”. I will be happy to test the effect of these different combinations on my blood sugar. Where do you purchase inulin? I just made a batch of chocolates using the recipe from Carolyn Ketchum “All day I dream about food”. I substituted truvia for swerve. I was disappointed by the endothermic effect. Also, my sister who is prediabetic is exquisitely sensitive to The bitter aftertaste of Stevia. Can I use raw potato starch in place of the inulin? It’s also pure fiber. It all sounds so scary, but it’s always good to find humor wherever possible. Since yo2u18&#7;ve found the humor in this, I’m sure you can find it in everything! I hope your family has a Merry Christmas with lots of egg nog and laughter! ti-guy, we always knew you were a fundamental extremist religious freak, with Dion as your god. And if you expect ‘expect better from the NDP’, you’re either going to be sadly disappointed or you’ve got very low exsoetaticnp. About all you can expect from the NDP these days is outright stupidity. Big help, big help. And survilatpee news of course. sazeaharhl, love that review, but if someone has an account there, they could kindly correct them, that David co-wrote Broken with Jon Hunt Watching DWTS right now! Fun! Thanks for your kind explanation and recipe. I tried to make an ice cream following you and made it! but, i could feel my throat was prickling at the end of the taste. i guess erythritol and stevia caused it. do you know how to get rid of this feeling?